What do you think of me being here at the Vancouver Aquarium? Here is what I am told was a note sent to staff at the Vancouver Aquarium, to help address the issues raised in Blackfish. It is a lot more reasoned than SeaWorld’s response to Blackfish, but at the same time is an interesting insight into the arguments aquariums make about captive marine mammals. 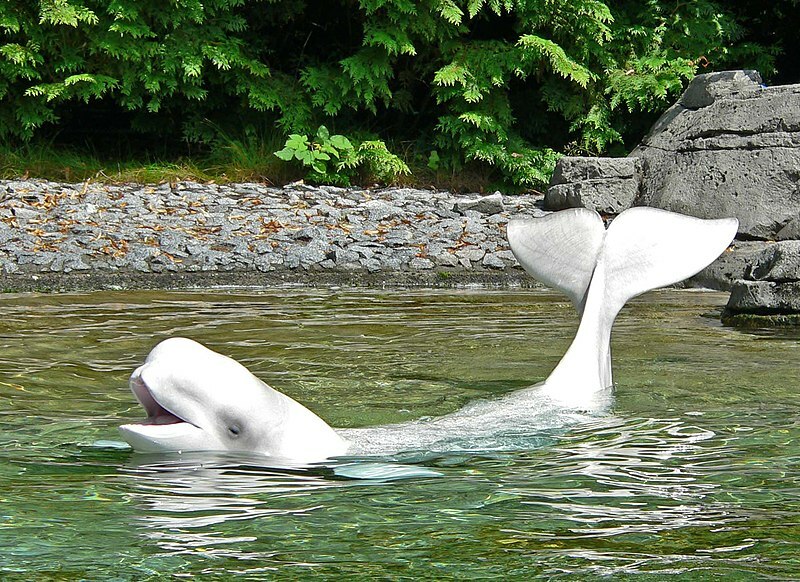 Vancouver Aquarium has had a long and checkered history, that has included trading in, and keeping captive, killer whales, dolphins and belugas. At the same time, it is a non-profit, and I think is qualitatively different (especially in its current version) than a for-profit entertainment corporation like SeaWorld. That doesn’t mean I think that Vancouver Aquarium should keep cetaceans, or has always acted sincerely or with the best interests of marine mammals in mind. I don’t (and I wish more aquariums would follow the more ethical model of the Monterey Aquarium). But I do think that Vancouver Aquarium is on more solid ground when it comes to trying to make the case for keeping cetaceans captive. So their arguments are worth noting. That said, what I think is most interesting about Vancouver Aquarium’s response to Blackfish is that it doesn’t really try to make the case that marine mammals are suitable for captivity, and don’t suffer in captivity. Instead, it makes the tried and truthy argument that keeping marine mammals captive helps humans connect with them and care about how they are doing in the wild. In other words, there is a trade-off, and the ends justify the means. I disagree with that calculus, and think that the more people understand the reality of what killer whales and dolphins experience in captivity, the less they will be willing to buy that argument. Some of you may have seen the documentary “Blackfish” which has been playing in theatres across North America and aired on CNN several times last week. The film is a documentary that focuses on SeaWorld, their display of killer whales and the tragic death of one of their trainers in 2010. SeaWorld chose not to participate in the making of the documentary. Blackfish attempts to “expose” SeaWorld’s supposed negligence in areas from employee safety to animal welfare largely through personal opinion and allegations made by a handful of former trainers depicted in the film. Some of the footage and testimony is disturbing and there are staff here that can tell you from first-hand experience that caring for killer whales is a demanding occupation, requiring concentration at all times and a comprehensive understanding of killer whale behaviour. A member of the Senior Staff has spent a great deal of time working with the professional and dedicated team at SeaWorld and has also spent time at all their facilities and with many of their animals. He comments that their facilities are amazing, their animal care expertise is outstanding, the safety training that he has witnessed is first class and, without a doubt, their research has directly and positively impacted the lives of thousands of marine mammals around the world. SeaWorld, like all U.S. facilities caring for marine mammals, is licensed to do so by the U.S. federal government and regularly inspected. SeaWorld adheres to the strict standards of all federal and state laws, including the Animal Welfare Act and the Marine Mammal Protection Act, as well as the professional Standards and Guidelines of the international Alliance of Marine Mammal Parks and Aquariums, which surpass government standards for the care of the animals. Although the film is not about Vancouver Aquarium, it is important to share some of our messaging on killer whales so that you may respond to inquiries as needed. What happened to the killer whales at Vancouver Aquarium? Bjossa, the Vancouver Aquarium’s last killer whale, was transferred to SeaWorld in San Diego in April 2001 to provide her with the companionship of other killer whales. Sadly, Bjossa succumbed to a chronic lung infection that she had been battling for two years and passed away on October 8, 2001. What is the Aquarium’s policy on capturing whales and dolphins? Why have animals in aquariums? Aquariums perform a vital role in educating people about aquatic conservation and contribute to critical research to conserve aquatic life. Seeing animals in aquariums has helped change public perception and increased support for conserving wild populations. There is no real substitute for connecting with our oceans and animals first-hand to generate a feeling of interest and engagement that leads to positive behavioral changes. Wow. Sounds like damage control to me. Agreed. We get it, You’re all terrible. Use your millions of dollars to help set these animals free. Have some self respect man. The old adage “they must see dolphins or whales to connect with them” is not true. Children and even adults have never seen a dinosaur but they are one of the most popular topics of children’s conversations and their toys. They are stars of some of the biggest and most popular movies ever made, books, museums, and entertainment–including robotics. Big thumbs up for an excellent argument, One concern with captive whales is that children and alas, many adults, might think of them as big pets or that captivity is a viable way of preserving large species (cetaceans, elephants, etc.) that require a large territory and useful learning experiences. Balancing a ball is NOT a useful skill. The petting zoo mentality extends to human interactions with wild animals -such as the woman who was trying to feed junk food to a bighorn sheep I told her off and she left. Wish I’d taken her license plate number (If I’d know at the time…). I have no plans to ever swim with dolphins.Ethical and safety issues apart, it doesn’t sound appealing. Someone described it as hanging on to a very oily animal with a rock hard body. Ooookay, so it’s like holding on to a well-oiled body builder as he or she swims laps??? Vancouver Aquarium’s administrators are obviously hanging out in Toronto a lot and smoking crack with Mayor Ford. HELLO? We have the INTERNET now, We can study animals or anything else at the touch of a finger. I share your feelings towards VA. They do some great work with wild orcas, understand the value of wild cetacean research and their Blackfish Sounder magazines are very informative. The only thing that stops being being a supporter is their refusal to end their beluga breeding program. A program that has been an abject failure with only one calf (Qila) surviving past three years. Kills me when I see this “…their animal care expertise is outstanding”. If caring for the whale, they wouldn’t have them in the first place. Thus, caring is really controlling sickness, injury and mental state as best possible. Let me think this idea through. In the 1700-1800’s African slaves were designated as ‘chattel’, uhh…’things’ instead of people. Excuse me for being honest……Animals to be exact. Therefore, is the Vancouver Aquarium saying in order for people to “connect” with them , we must literally “see” them or “touch” them? This could not be true because the public is disallowed from touching them. Also, to “see” them , all we need is a webcam. Following their logic, they must be angry as hell that there are no longer ‘slaves’ to be ‘observed’ for ‘conservation’ then, right? Why aren’t they trying to apologize for not keeping a few African slave families at the zoo to observe over the last few generations? You know, they don’t seem to be doing their purpose well, do they? Their statement says they are ONLY keeping the ones captured before 1966 (rescued ? ?… really, got that on video?). That the ‘proper government authorities’ labeled them “deemed unreleasable” is utterly untruthful. That the Vancouver Aquarium can legally label themselves as a non-profit, is very shaming and damning. So, if they release them into their natural habitat, what can/will they possibly do wrong? The meaning of the word, “Rehabilitation” designates a short period of time, so that a creature CAN be put back into their natural environment. Humans and Animals. So, when is their release date designated for? As well,…. as a 501(c)3 status, when will your Goal, Mission Statement, Vision Statement that you filed with the government, stated in your Non-profit papers be reached? A non-profit has to be for the social good, or the welfare of animals, or people ,etc..
An investigation into all zoos is in order here.